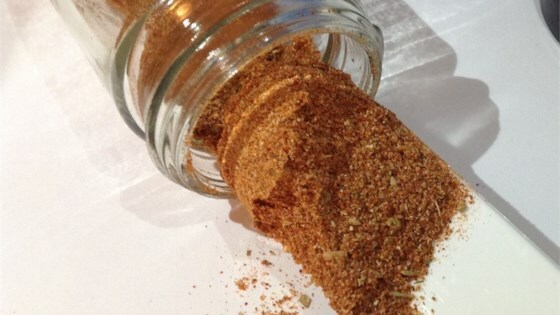 "This seasoning is used often in Mexican and Filipino dishes; I've recently started mixing my own seasonings." In a bowl, stir together the salt, paprika, black pepper, onion powder, oregano, cumin, garlic powder, and chili powder. Store in a sealed jar in a cool, dry place. I made a half batch of this last night and sprinkled most of it over a huge bowl of lightly buttered air popped popcorn. GREAT. Even my kids snarfed it. Looks good! Smells good! Easy to make! I did not put in the salt because we tend not to use any, and I think the seasoning is fine without it! Thanks for the recipe!